Peter B. Gray's music is an easy listening, melodious, adult contemporary rock style with lots of harmonies and great hooks. Peter B. Gray is a songwriter who combines his passion for music with his other loves – nature, family, relationships, and his dental-medical profession. Peter’s music, like that of musicians who have inspired him (such as the Beatles, Eagles and America) is poetry unfolding to beautiful melodies. His songs come from the heart with a freshness and originality that leave the listener with a long-lasting impression and desire to hear more. Peter Gray was born in New York state and raised in a small town in the lovely state of Vermont. From childhood, music, family and nature have been a big part of who Peter is. Many of his songs, like "Magic In Your Eyes" and "We All Must Choose," draw from his poignant relationships. Others, such as “Snowing in the City,” capture the beauty and serenity of his home state. His parents cultivated an appreciation of both music and education in Peter and his four siblings. After attending public high school in Vermont, Peter graduated from Hamilton College with a BA in Psychobiology and Anthropology, and then earned his degree in Medical Dentistry from Tufts University. After completing 4 years of surgical residency in Philadelphia Peter’s love for New England and his family connections drew him back to Vermont where he set up a practice in mouth and face surgery in the 90s. Peter’s early musical inspirations came from his maternal grandfather, Carlton Hopkins, whom he emulated and was wholly devoted to; and from his father’s mother, Margaret Gray. Both grandparents were blessed with magnificent singing voices and professional musical achievements of their own. Peter also inherited a connection to music from his mother, Sue Gray, who nurtured his singing and instrumental talents as well as his interests in sports, magic, literature, history, science, and artistic expression. He took piano lessons at an early age, then in his teens he turned to the guitar for its sheer enjoyment and his desire to be in a singing group. Peter was always a voracious reader and a creator of poems, and this can be seen in his music. His songs are lyrical and poetic expressions of who he is and what he cares most about. After creating a healthy stock of his own compositions, Peter began performing them, and sometimes collaborated with a singing partner, Jeff Brewer. One of the most notable things about Peter B. Gray is his natural gift for music. His mother reported that “He was singing before he was talking!” and that “he could always carry a tune even without knowing the words.” Tapping this wellspring of creative talent and musical instinct, Peter taught himself how to play the piano, the guitar, and the harmonica. He plays all of these beautifully by ear. In the 70’s Peter became hugely influenced by the Beatles, nearly wearing out his older brother Jim’s collection of records by the British group. Even today he feels that the Beatles are the greatest contemporary musical group ever assembled. He was also deeply affected by their solo careers and by the likes of The Eagles, The Who, America, CSNY, The Guess Who, Bread, Dan Fogelberg, The Doobie Brothers, Bruce Springsteen, Billy Joel, Elton John, Simon and Garfunkel, and a plethora of other artists from the 70’s, 80’s and 90’s that fell within his genre of easy listening or melodious adult contemporary rock, rich with great hooks and strong harmonies. 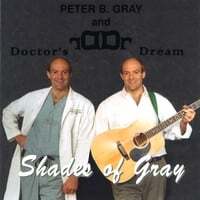 During the 90’s Peter focused on building his surgical practice and raising his children Emily and Maggie (both may be heard singing on his CD). At the close of the decade he decided to take all the years of singing and songwriting and follow a lifelong dream of professionally producing a CD of songs drawn from meaningful events in his life. Shades of Gray was born. Balancing his music, work, family and other life relationships has been challenging at times. Peter has struggled and overcome setbacks and these themes resonate in his music.